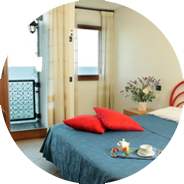 The Residence Moresco offers one-two- and three-room-apartments. Microware oven and one weekly change of linen for kitchen, bath and bedroom in every apartment. The prices include electricity, warm water and taxes. The Residence MORESCO in Ceriale, situated directly on the Ligurian Sea, with free beaches and beaches in front, and offers pleasant holidays at the Riviera delle Palme. 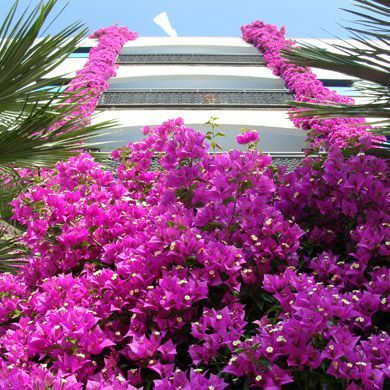 Built in Arabic style in 1964 it has been completely renovated in 1997. Every year, improvements are implemented to the structure to keep the property always to cutting edge with all modern comforts. with a big terrace on the back side, consisting of a double room plus single bed, big living room with two single sofa beds, separated cooking area and bathroom. 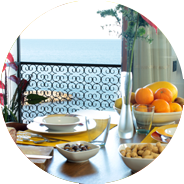 with balcony with direct sea view, consisting of a big living room with two single sofa beds and a third one extractable (with orthopedic mattresses), completely equipped cooking area and bathroom. on mezzanine, consisting of a double room (sometimes plus single bed), big living room with one or two sofa beds, cooking area and bathroom. Sat-TV, direct-dial Telephones, ventilation paddle, Microwave oven and hair-dryer in every apartment. with one direct sea view balcony or with two lateral sea view balconies, consisting of a double room plus single bed, a big living room with two single sofa beds, cooking area and bathroom. with two lateral sea view balconies, consisting of a double room plus single bed, a twin room, a big living room, separated cooking area and bath with anteroom. One of them has also a big terrace on the back side. 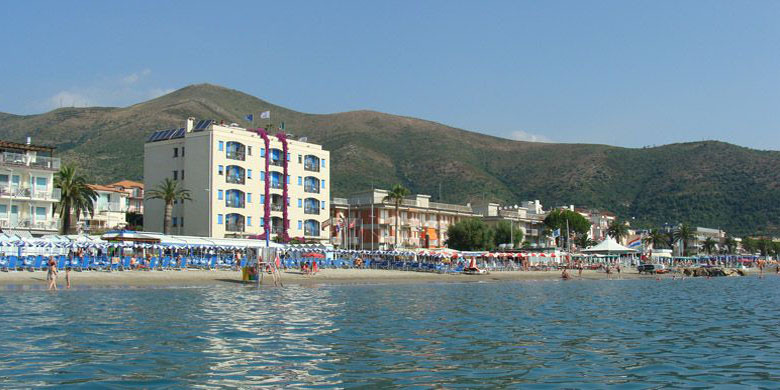 The Riviera offers a lot of amusement for everybody, the most important are: the Water Park “Le Caravelle” (only 800mt away), the Hippodrome “dei Fiori” in Villanova d’Albenga, several dancings, the nightlife of Alassio, the caves of Toirano, the golf of Garlenda (18 holes), the casino of San Remo and several other activities to discover. For the sports fans, our land offers spoiled for choice like for example the water sports as wind surf, kite surf, sailing. In the hinterland it’s possible to make trekking, montainbike, free ride, canyoning, climbing, riding, etc. If you like to move you’ll find your happiness, you only have to choice the right sport. Remember that Ceriale is only 100km distant from Montecarlo and Portofino and less than 60km from San Remo.